Reduced to clear! (normally $15) The Phobya Multi SATA3 cable is great for neatly cabling your hard drives and optical drives using a single sleeved cable. 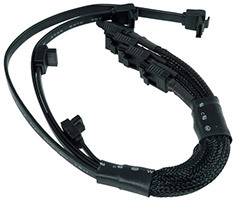 Suitable for SATA3 devices and includes safety latches to keep the cables in place.